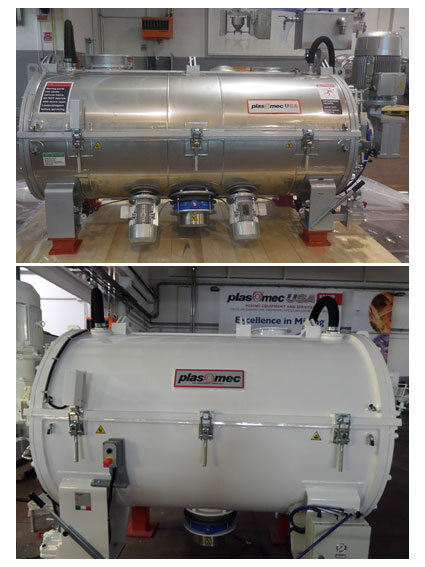 The development and optimization of the coolers of mixing plant is the latest innovation launched by PLAS MEC and has been welcomed with great interest. Thanks to PLAS MEC, today it is a straightforward task to cool over 8 batches per hour of U-PVC from 120°C to 40°C. The new water circuit design increases cooling efficiency enabling a significant increase in the productivity of the cooler and, therefore, the mixing plant. The new cooling interspace can withstand a working pressure of 2.5 bar, a typical pressure of factory closed circuit chillers. This, in addition to increasing the efficiency of heat exchange, solves many critical issues typical of closed circuit chillers. The PLAS MEC technical team has developed this innovation through close collaboration with its customers and by systematically analyzing and comparing data in order to create new ideas and continuously innovate our products.